Wouldn’t it be great to have some elbow room while you sit drinking your ice cold beer and enjoy the fireworks from our private beer garden with a private bar? Better yet, wouldn’t it be great to invite your clients, family, and friends to enjoy them with you?? *Sponsors: Ask about your special pricing! Well, NOW is your chance to take advantage of this special opportunity at the Sugar Grove Corn Boil! Packages are available for our Saturday night spectacular fireworks show! Act NOW! We are limiting the number of groups in the beer garden to keep it safe from overcrowding and to provide you with the best VIP experience. Private bar – no waiting in line at the beer tent during Fireworks! One Corn Boil meal per person – hotdog, sweet corn, and water with special jump-the-line privileges at the Corn Boil Food Pavilion! 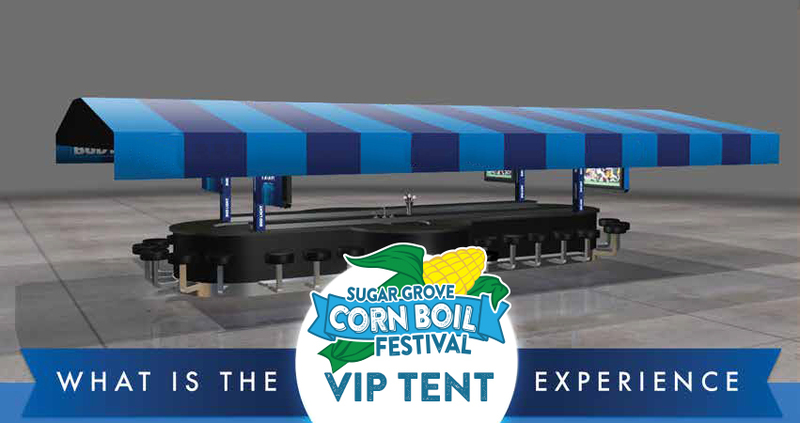 Packages include private bar, private seating, drink ticket(s) & Corn Boil hotdog & sweet corn! Private seating Saturday night with a great view of the bands & fireworks! Thank you to our exclusive VIP Tent Sponsor!